ANDOVER – For Paul, Viki and their two daughters Amanda and Emily Allin, the biggest question they are constantly being asked is when their new business Bakery on the Square plans to open within Andover. (From Dec. 7 edition). According to Viki Allin a lot of improvements were made to their building at 34 Public Square since selling their Meadville storefront, but recently encountered an issue in trying to find someone who could install a type two, non-Ansul exhaust system. As far as other work that has been done to the business Vicki said includes mostly floors and wall work, as well as some changes in a few light fixtures and repairs to the roof. In addition to the main work Vicki said their family has also sanded, mudded and painted the walls, as well as have worked alongside their business neighbor The Town Tavern who put in French drains around their building back area while ensuring the Allin’s roof would go into new gutters. Currently the Allins are working on the furniture and display area for the front, as well as plan to contact someone to have a three hold sink, hand sink, mop sink and sink for the coffee area to be put into their business so that they can serve customers fresh roasted coffee by cooking beans in their hearth oven, while also providing coffee from local roasters like Harbor Perk of Ashtabula. Once they are up and running Vicki said she is looking forward to making new items like chiffon cakes and sugar cream pies, olive and rosemary bread, savory focaccia, walnut tarts and hermit bars, along with chai tea from scratch. For further information about Andover’s soon-to-be new business Bakery on the Square please visit their website www.bakeryonthesquare.com or follow them on Facebook. 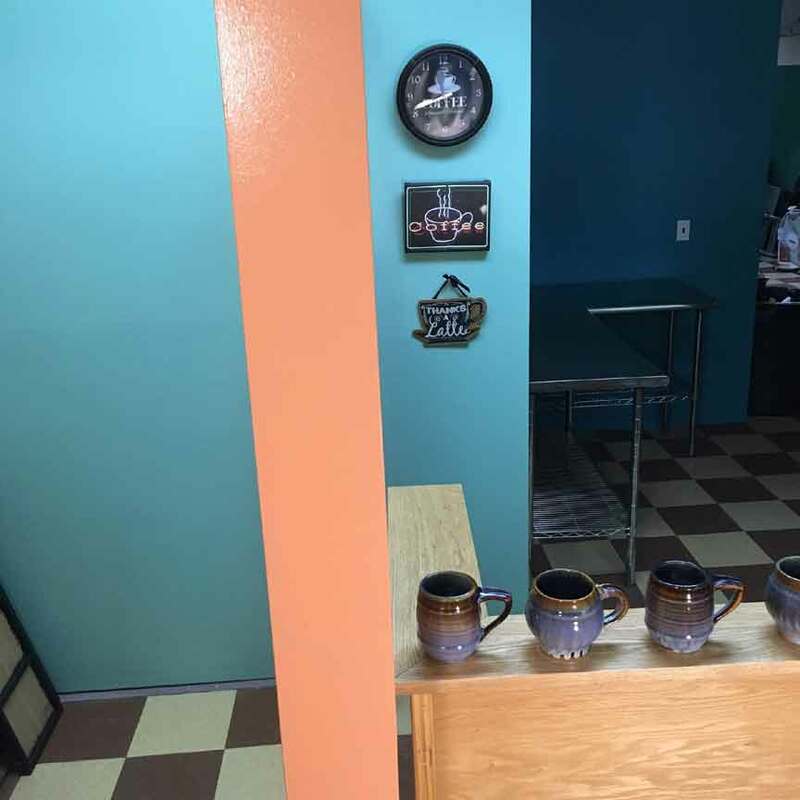 Pictured: Several mugs on the counter, as well as a few coffee-related decorations decked on the walls of Bakery on the Square within its location in Andover.